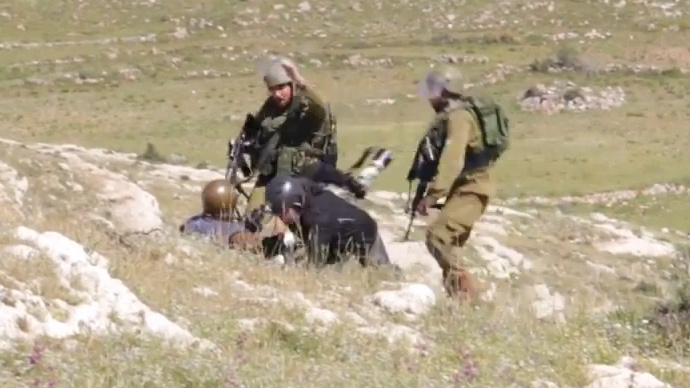 A video has emerged showing Israeli forces assaulting photojournalists near the West Bank town of Nabi Saleh. Despite being clearly marked as members of the press, the soldiers push the photographers to the ground and proceed to hit them. One of the troops also throws a stone at a journalist. One of the soldiers is then seen pushing one of the photographers to the ground with his helmet. Another soldier knocks the other photographer to the ground and then picks up a stone and hurls it at him. The attack happened on Friday. Since then the Israeli army has stated that the area was a closed military zone and that dozens of Palestinian protesters gathered there and hurled stones at IDF soldiers prior to the assault of journalists. “The IDF guidelines allow for free press coverage in the territory under control of the Central Command in general, and specifically during demonstrations,” he added. The matter will be looked into shortly, the spokesman concluded. It’s by no means the first time that the IDF has targeted journalists and assaulted them. Last July, at least seven Palestinian journalists and media workers were killed in during the assault on Gaza and IDF forces directly hit at least four media offices. During the November 2012 conflict, at least four Israeli attacks on media workers and facilities in Gaza were reported. In those attacks, two Palestinian cameramen were killed and at least 10 other media employees wounded.